Just like with the Fetch! 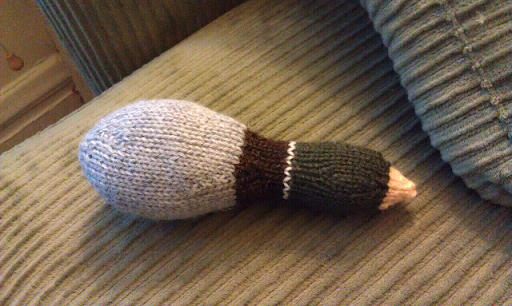 project, I decided I would rather knit this duck dog toy in the round. This time it is a very simple conversion: Just knit the rows where it says purl! I decided not to felt the duck, so I knit the bird with size 3 needles so it would be tight enough to stand up against Indy's teeth. The pattern consumed 2 g of Berroco Peruvia in brown, 3 g of KnitPicks Wool of the Andes (WOTA) in Evergreen, 1 g of WOTA daffodil and 8 g of WOTA lake ice heather. Row 40 I switched to brown. Row49 use some scrap white for a single row . 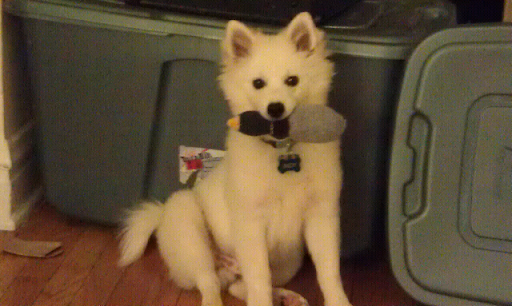 I had rescued a squeeker from Indy's Monkey toy, and felt that it would be perfect to include in this duck toy. 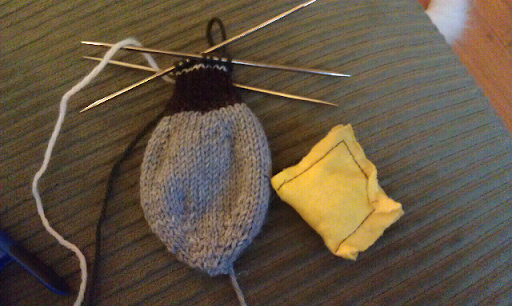 I wrapped the squeeker in the pollyfill stuffing, and then inserted it inside the gray portion of the duck. Indy already loves this toy. Too bad he cannot have it for keeps until Christmas!